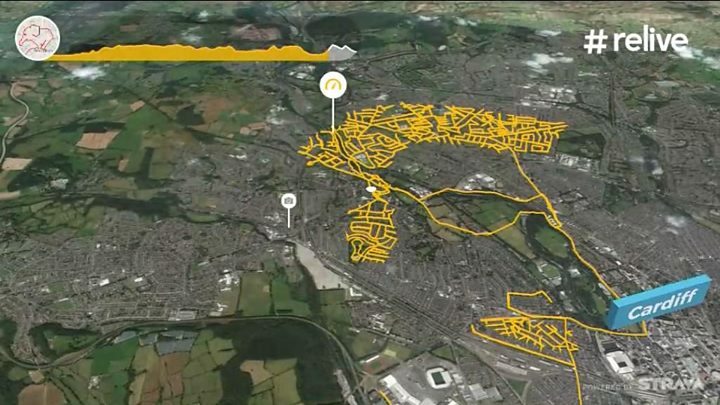 Cyclist Anthony Hoyte has created a virtual face on the roads of Cardiff but it can only be seen when viewing his 78-mile route on a map. He used the exercise and route sharing app Strava to make his "ludicrous" artwork, with a 'nose' around Bute Park creating the most striking feature. He even nipped up and down roads around Canton to fashion a moustache. "Note to self: don't do hair again," he said, referring to a complex network of roads he travelled around Whitchurch. What are the UK's top areas for running and cycling?